The Aymara people originated in the Aymara domains (1200 -1400 Christian Era) that began to appear following the downfall of Tiwanaku (1000-1100 CE). 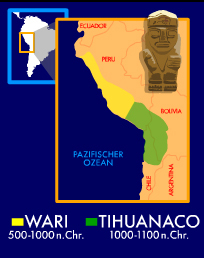 We can trace them even further back, however, to the Wari culture (500-1000 CE) who spoke a proto-aymara. These Aymara dominions eventually expanded through the Andes, widening their radius of influence. They had no centralized political power, which explains the constant conflicts that arose between them. 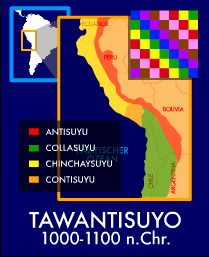 During the era when the Aymara were in full expansion, in about 1450, the Tawantisuyu (Inka) arose and eventually incorporated the Aymara into the organization of their state. The Tawantisuyu was composed of four regions or suyus. In the northeast was the area of Antisuyu, towards the southeast was Collasuyu, in the northwest was Chinchaysuyu, and Contisuyu was in the southeast. It was during the Tawantisuyu era that the Andean culture, of which the Aymara formed a part, was at its height of influence and expansion. It extended its authority from present day Ecuador in the north to what is today central Chile in the south. When the European invasion began in 1532, lead by Francisco Pizarro during the reign of Inka Atahualpa, the decline of the Aymara culture began. The Aymara, who inhabited territory that is today in Chile, began a gradual retreat. They left the coastal areas for the foothills and the Andean High Plain due to pressure from the Spanish population which occupied the lower regions, especially in the Lluta and Azapa Valleys and the settlements of Tarapaca and Pica. The native population remained between the mountains and the High Plain, where the fixation of the Aymaras’ linguistic and ethic importance concluded their dominance of the area. The Aymara people originated in the Aymara domains (1200 -1400 Christian Era) that began to appear following the downfall of Tiwanaku (1000-1100 CE). We can trace them even further back, however, to the Wari culture (500-1000 CE) who spoke a proto-aymara. These Aymara dominions eventually expanded through the Andes, widening their radius of influence. They had no centralized political power, which explains the constant conflicts that arose between them.